This Best-in-Class Countertop Home Water Distiller comes with a One Gallon, Break-Resistant, Food-Grade, (BPA-Free), Polypropylene Collection/Serving Pitcher, (Carafe). 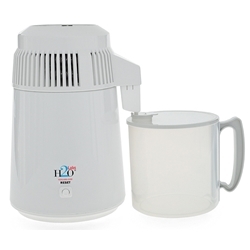 It has a White Baked-Enamel metal main body exterior and 100% Stainless Steel interior steam chamber and condensing coil and also features single-button start, automatically turns off, and is very easy to clean. one thought about cleaning - I hear if you leave a bit of water in the bottom instead of letting the distiller turn itself off....that it is then very easy to clean out the sediment in the base ...have not tried yet. This has been the absolute best purchase I have made this year. The distiller works perfectly every time, is a breeze to clean and operate, and saves money from the day it arrives. It is a joy to use, and will more than pay for itself within the year. Highly recommend! I use 1/2" of vinegar in the bottom of the distiller to clean it. After soaking for an hour, I fill to the "full" line with water and leave it for a few hours. Rinse, and it's ready to go, clean as new. Haven't had to use the cleaner provided yet. Love it. So far, so good. I'm making my 5th gallon now. I think I might need to buy stock in CLR cleaner. It's the quickest way to clean out the deposits in the bottom. Who knew there was so much garbage in the water? wow this machine works great and great tasting water.